How to make vape juice ? 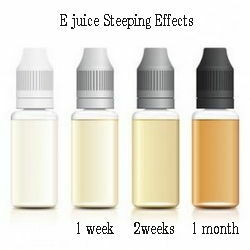 Experienced vapers who kindly advise newcomers to the forums frequently mention DIY e liquid to satisfy everyone's personal tastes and possibly save on recurring purchases of ready-to-use e juices. If you're wondering, it's time for you to learn the art of making e cigarette vape juice. Preparing your own electronic cigarette e liquid can be very fun for some or very frustrating for others. But this is related to the degree of experience. What are the ingredients of an electronic cigarette liquid? How to calculate nicotine dose? What is the necessary for the DIY e liquid ? How to make a liquid ? How to make a nicotine free e liquid ? Can I use all food flavors ? Can I use essential oils in e liquid ? Do I have to store e liquid in fridge ? Flavors only for vape ? Where to find e liquid recipes ? Some people will make you believe that creating a recipe and making a liquid requires a mastery of DIY, chemistry skills, exceptional know-how coupled with an over-equipped laboratory. The truth is quite different ! Anyone can do this simple mix, even in the kitchen! Just a few accessories and specific ingredients. And all that is needed is easily found in specialty shops, you already know it. Think recipes will help you tremendously in creating the liquid that suits you best. A list of ingredients, minimal equipment, and some assembly instructions. Start with simple recipes and end with more complex recipes that meet your expectations. You will come with patience to create for yourself the extreme flavor, while making substantial savings. So here's how to make your own e juice. What ingredients are in e liquid ? Complicated, you say? The composition of a liquid is more than summary! It only takes 4 ingredients to compose a liquid. From their barbaric names, they are called PG, VG, flavor and liquid nicotine. And you can even remove nicotine and use a 50 50 PG VG base! It only takes 2 ingredients to make a flavored cigarette liquid! What are the levels of nicotine in e juice ? How to calculate nicotine in e liquid ? 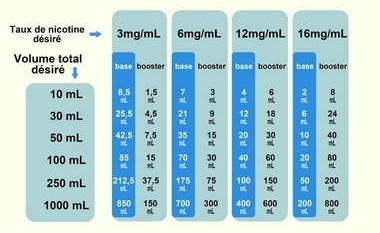 To obtain a nicotine base, you will have to dilute liquid nicotine in your PG and / or VG base according to the grammage you want. For beginners, it is desirable to use nicotine levels between 8 and 20mg and then adjust the dosage according to the felt perceived over the weeks. Below we give you an estimate of the amount of nicotine needed in equivalence with nicotine in tobacco cigarettes. Note that this is a very simplified indication because inhaled nicotine in burned tobacco does not have the same impact as synthetic nicotine, which spreads very slowly. How much nicotine is in a cigarette and the liquid nicotine equivalence ? Note that some nicotine bases have a taste. Depending on the dosage, it will also have an impact on the flavor. For this reason, the taste from one palace to another can be very different. Make sure you follow the recommended measures in the handling of nicotine. Since January 2017, French legislation requires the delivery of nicotine only in the 10ml bottle. The nicotine booster contains a solution composed of propylene glycol and vegetable glycerine, preservatives of nicotine diluted to 20 mg/ml. What is the best PG VG ratio for vaping ? Propylene glycol and/or vegetable glycerin will thinners your diye liquid preparations. Nicotine and flavors are very concentrated and should be diluted to get a nice mix. Note that the PG is also a conservative. How to calculate PG percentage ? There are differences between PG and VG. They have a different taste, a different viscosity that impacts on vaping sensations. Most e-liquids available on the market have a PG / VG ratio. The most common are 70/30, 50/50 or 30/70. Most e juice flavors are offered in PG. You can find this information on each product page on our site. Propylene glycol is a diol (organic chemical compound) for use in the food industry, tobacco, care products. It is used in topical, oral, injectable and inhaled by the pharmaceutical industry. The PG does not alter the flavor unlike vegetable glycerin. It further provides a more consistent "hit" (contraction of the throat), which for some can turn into a real irritation. This phenomenon is rare but some users have developed an allergy to PG and now favor a larger ratio in VG. Content in most of the e liquids, propylene glycol is a preservative widely used in the food industry and approved by the health authorities. It is a clear, fluid, tasteless and odorless liquid found in food, tobacco products and certain medications. Vegetable glycerin (often derived from vegetable oils, coconut, soy ...) is soft, sweet but more viscous than PG. A high rate of VG permeate less rapidly atomizer wick and will tend to alter the flavors. That's why we recommend increasing the dosage of flavor if you use a basic high VG ratio. However, the VG is now adopted by many vapers especially by users of dripper (without atomizer tank), fans of pretty clouds. There are many varieties of food flavorings that are easily found in commerce. Nevertheless, it is important to select the flavors for vape. Most flavors are not intended to be inhaled and present potential risks to the vaper. We therefore advise you to contact the professionals of the electronic cigarette to obtain specific flavors for vaping. The average dosage of a liquid flavor is 10 to 20%. You just have to follow the recommendations of the manufacturers. Of course, you'll need flavoring. We offer more than 300 of the best flavor concentrates for vaping - tobacco, fruit, gourmet, menthol - from various e juice flavor concentrate brands, famous for being specialized in the vape. They are free of diacetyl and for many, acetyl propionyl and acetoin to ensure safe use. Again, you will find detailed information at the bottom of each product. Furthermore, we make sure to keep us informed of product developments and studies to ensure appropriate flavors. Well, don't be afraid to start, with empty bottles, syringes, gloves and unleash your creativity to mix perfect blend. Beyond being able to make your e liquid, these bottles must be equipped with a child safety, a system blocking the easy opening - not to neglect the security. These empty bottles available in multiple capacities are affordable and delivered by all specialty shops. They will be useful for you to create your recipes and store your creations. Allowing to transfer the neutral base into the bottle, the syringe is essential, as the pipette that allows to accurately dose the flavors. How to make your own e juice ? Nicotine boosters in a 10ml bottle really simplified the calculations for making your eliquid. It is now sufficient to dump the corresponding number of nicotine bottles into a neutral base to make a nicotine base of the desired grammage. In fact, this is the most complicated step in DIY e juice. The dosage must be very controlled to obtain a satisfying result. Not enough aroma will deceive you on the quality of the recipe, an overload of flavors destroys the harmony of a recipe. As a beginner, we advise you to start this experiment by handling only one or two flavors. Trial and error is part of DIY learning but starting wisely avoids the waste and disappointment that results. Also, as long as you do not master your recipe, do not make large amounts. Stick to a 10ml bottle and give yourself the time of discovery to take the plunge. Artificial flavors are often delicate when paired with other flavors. So, if you add the recommended percentage by the manufacturer to your base and do not feel a strong taste, adding a few more milliliters will not help. In e-liquid mixtures, some flavors are sometimes the opposite of what you expect. You can choose any PG / VG ratio. The most common are 50/50 and 70/30 - the first number is propylene glycol. Propylene glycol allergy forces some users to increase the proportion of glycerin, sometimes even to use a pure VG base, also called full VG base. At this point, all that remains is to pour the whole into a bottle and shake it (and even longer when it is a high glycerin liquid). Steep which means let the liquid rest. In fact, steep is a preference for some but it is also true that just like a good wine, some recipes improve with time. Of course you can taste your e-liquid just after creating it. If it is to your taste and satisfies you fully, the steeping time is no longer necessary. If this is not the case, you can wait for the oxidation of its components by storing it away from light in a cool place. There is no definite period of time, but for some blends it takes months of steeping for the flavors to achieve harmony. Over time, the densest components settle to the bottom of the bottle. It is therefore necessary to shake it regularly. You can also remove the cap of the bottle of e liquid and let the air play its role, allow the evaporation of all that is volatile and in particular the alcohol contained in certain aromas. Some diyers even use stirrers and other ultrasonic cleaners to speed up the steeping time. To each his method. After this rest period, the color of the liquid may also change due to the oxidation of nicotine. If at the end of your preparation, your liquid was clear, you may find it brownish a few times later and it will be normal. In fact, this color change is a sign that your liquid has normally aged. In terms of steeping, nothing can be perfectly controlled. It just takes patience and patience! The process is long. But the result is often worth the effort. How to steep vape juice ? Note that fruit flavors or mint are known not to require a steeping time. On the other hand, gourmet flavors or tobacco flavors need a long maturation. The best way to learn how to make an e-juice is to embark on the adventure without apprehension. Today, the manipulation of nicotine is no longer really a security problem. Spilling one or more bottles of nicotine in a neutral base does not expose to any particular danger. As for recipes of e liquid, you will find them everywhere on this site ... and on the net! 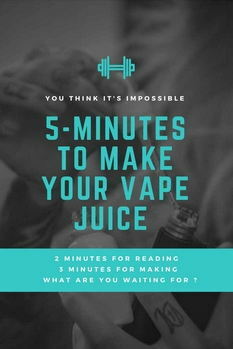 To prepare this recipe in a 10ml bottle, start by creating your nicotine base depending on the desired nicotine level then spill 5% of each flavor. 10ml x 5 (%) divided by 100, or 0.5ml of each flavor. So you will have to add a total of 1.5ml of the three associated flavors. All you have to do is add 8.5ml of nicotine base (or not) to get a 10ml liquid. - How to test e liquid ? After the steep period, come to taste your recipe. We advise you to use preferably a dripper (a tankless atomizer) of good quality rather than a tank for a better perception of the flavors. Also note that the power of your electronic mod, the ohms that it delivers and the temperature reached according to the setting can distort the flavors. An acceptable 10 watts liquid will sometimes be detestable at 30 watts. - How to store vape juice ? Sun, heat and air can negatively impact your liquid. It is therefore recommended to store them away from light and in a cool place but not necessarily a fridge. In the same way that the setting of your electronic mod influences your felt, the maintenance of the material also has a direct impact on the perception of your e liquid. Too old atomizer resistance that has not been replaced for a long time will produce an altered taste, diminishing the flavors or even delivering an unpleasant taste. Pushing the watts to their maximum without you noticing it destroys the flavors and completely denatures the liquid. Remember that any abnormal perception of flavors must interrupt your vape. A bad taste does not necessarily come from the juice but can be related to the equipment, its adjustment, its wear and its lack of maintenance. A resistance must be changed very regularly as much for hygiene as for safety. Finally, remains a crucial detail, the vaper himself. If you have stopped smoking recently, your taste buds are always altered. Also, a liquid that seems tasteless today will be very different in a few weeks when your taste buds have recovered. This medical term refers to the loss of taste. There is also dysgeusia which results in an alteration of the taste that leads the vaper to a wrong perception. And finally, hypogeusia, which results in a very diminished perception of taste. These taste disorders are often transient and related to smoking cessation. The reconstitution of the taste buds sometimes causes strange sensations that can go as far as total rejection of a flavor once adored. Time improves this sensation without any special treatment. The confirmed vaper is also likely to notice a change in his perception of the flavors due to a saturation of the taste buds. It should be noted that some juices or concentrates are too rich in flavors and that the power of vaporization can also trigger this symptom. If you suffer from ageusia, dysgeusia or hypogeusia by saturation, it is then advisable to vape for a few days an unflavoured base or just lemon or mint, always preferring a single flavor. How to make your own vape juice without nicotine ? With or without nicotine, the method remains the same. Simply choose a neutral base with the ratio of your choice (50/50, full VG ...) then add the flavors of your recipe. This will give you an e juice without nicotine. Can I use all commercially available food flavors for vape? There is a huge difference between the food flavor and the flavor for electronic cigarette. Manufacturers have adapted their products to this specific use, removing many potentially harmful compounds by inhalation. It is, therefore, dangerous to introduce the conventional food flavorings available in many shops and supermarkets in the atomizer of the e-cigarette, their composition is not intended to be vaporized. Conversely, using e-liquid flavors in food is no problem. Can essential oils be used for flavoring ? Essential oils are not indicated for vaping. We could give in to temptation when we know their healing properties but we also know that the heat degrades their aromatic compounds. In addition, some substances may be irritating if not caustic for the lungs in direct inhalation. The precautionary principle is to apply in regard to essential oils and vape but nothing prevents you from enjoying their benefits in diffusion. From one flavor to another, the dosage of favors differs enormously. Most often, the manufacturers give a reference percentage. Nevertheless, everyone's taste buds also have a different perception. It is therefore sometimes difficult to indicate the dosage which will be satisfying. We used to recommend a 10% percentage to never overdose a diy flavor. It will often suffice for a fruity or gourmet flavor. As for tobacco flavors, the hand should be even lighter and according to the brand start at tiny proportions like 2 or 3%. Here again, we strongly advise you to note the indications of the product sheets which we have also carried over to your invoice for simplicity in the manufacture of e liquid. Should I store e liquid in the fridge? E liquids can be stored perfectly at room temperature. The propylene glycol that composes them is a preservative. They are not likely to deteriorate. Are these flavors only for vaping? All the flavors proposed on this site are food flavors. Their use in cooking or pastry is their primary goal. 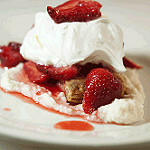 They can incorporate recipes for desserts or makeup drinks, flavor yogurt. For the vapers, they are never really lost. If they disappoint the e-cigarette, they go back to the food! - The first tip to remember here is to write down everything you prepare. What a disappointment if you create an all day you can not do without and do not know what you put in! - Browse the net and forums dedicated to the electronic cigarette. You will always learn from "old vapers" even in DIY. You will also find an incalculable number of e liquid recipes. - Use only flavors intended for vape and not any potentially dangerous food flavoring. - For your first tests, do not make large quantities. Remember that if you are disappointed with your recipe, you risk losing 100ml of nicotine base! - High proportion liquids in VG are recommended for the sub-ohm (use of a very low resistance to obtain an intense heating of the liquid) because they are thicker and require more heat to be vaporized. - Always store your ejuices out of the reach of children and animals. Where can I find inspiring e juice recipes? And even Arom-Team dedicates its Pinterest page to all kinds of illustrated DIY recipes! DiY is not intended for all vapers. This is a game of patience. But the enthusiast will find the satisfaction of composing custom vape juices while learning associations of tastes to apply recipes more and more complex. And then, in a moment of smoking cessation, the DiY is often fun and allows to distract yourself while discovering a new universe very far from the smoke. There are not only economic reasons for making e juice. There is also and above all a lot of fun. So what are you waiting for to try the adventure? How to easily make e liquid? The final advice we can give you is to start with simple recipes - we also show many recipes in each product as well as information on associations of flavors that could help you - and do not overdose flavors. Indeed, an overdosed aroma will lead you to an immediate sickness, mistaking you for the product quality. Dosing wisely, you will avoid disappointment and save your money. An under-dosed flavor is editable. An overdosed flavor is lost. 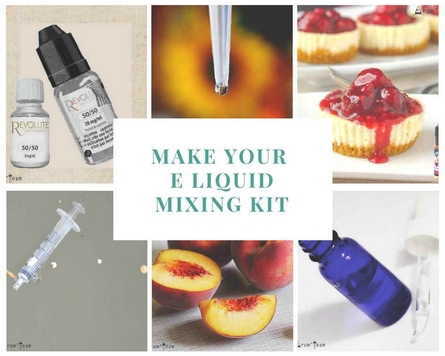 Your turn now to create the best diy e juice recipes or the best dessert recipe! Browse our catalog and find your grail HERE!